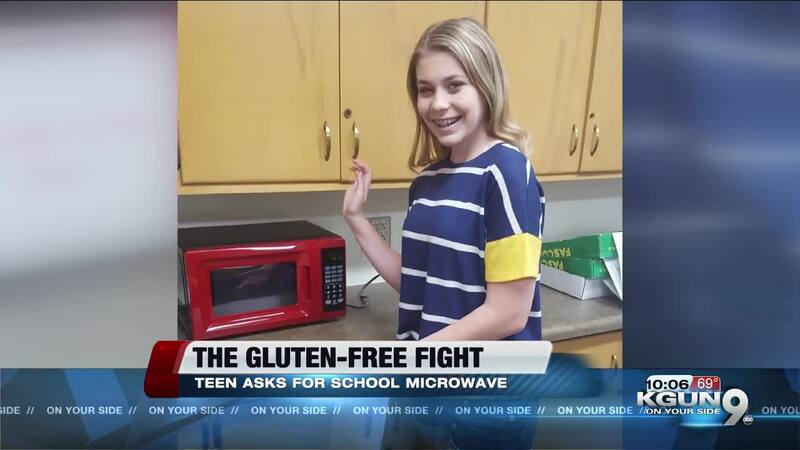 A Canyon Del Oro student won her fight to get a gluten free microwave in her school. Now, she's taking her fight to the state capitol to make sure other celiac students in Arizona can eat a hot lunch with everyone else. TUCSON, Ariz. — Nearly four years ago doctors gave 15-year-old Josephine Taylor a diagnosis that changed her life. She has celiac disease, an autoimmune disease, in which eating gluten will damage the patient's small intestine. The only treatment available is a strict, gluten-free diet. Gluten is a protein found in wheat, barley, and rye. It's found in countless food items. "Even with the littlest amount of gluten I'll get headaches, severe brain fog, and I'll have a lot of digestive issues that we won't go into," Josephine said, laughing. That can be a problem at school. Since her diagnosis, Josephine hasn't been able to eat any of the food offered at her school, so she hasn't had a hot lunch at school. "You can't ask someone to go and eat cold meals for 12 years of their school career," Josephine said. "It's not very fair compared to the other students." She had an idea -- a dedicated gluten-free microwave for her and other celiac students at her school to use to heat their own lunch with no risk of cross contamination. After a three and a half year battle, she finally had her first hot lunch at school on Thursday. Now, she's taking her fight to the state capitol. "This isn't just about me," Josephine said. "It's about all the celiac students. Not even in our school, but all across Arizona. Getting one microwave at my school would make it possible for so many other students to get microwaves in their schools." "That elevates it to a broader state, a public policy stage," Rep.Mark Finchem, District 11 said. "This isn't a one off. This is something that affects a lot of kids in our public schools." Finchem said it's late in the legislative session, but he's working to add an amendment to an existing education bill to make sure there's a microwave in every school for those with celiac to use. Josephine said her goal is to eventually get a microwave for celiac students at every school in the country. As Miss Pinal County's Outstanding Teen , Josephine has used her platform to draw awareness to autoimmune diseases. In addition to celiac, Josephine also has Hashimoto's disease.